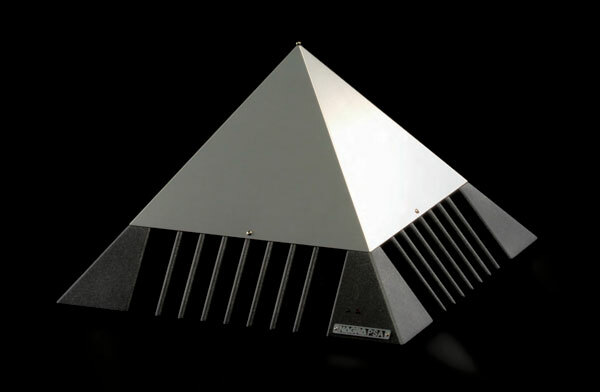 The PSA is a stereo version of the PMA mounted in a single pyramid chassis. It gives 100W of output power from a single stereo unit. The PSA provides the same sonic purity and natural transparency as the MPA but in a more compact format. Designed to be used in conjunction with either the PL-L or PL-P pre-amplifiers and is an efficient amplifier with a unique power factor correction system with auto start stop. The PSA is a single chassis unit, delivering 100 W (into 8Ω). The revolutionary concept encompasses an aluminium pyramidal design that is as functional as it is distinctive. The electronics benefit from the experience of the MPA, Nagra’s first solid-state power amplifier. The performance of an amplifier depends very much on the powering unit, thus on the mains’ quality. As the latter can’t really be improved, the PSA integrates a PFC – Power Factor Corrector. This device acts like a reserve of power to deliver pure DC voltages to the amplifier. Benefiting from Nagra’s first PFC developed for the MPA, the pyramid’s innovative PFC is the subject of a new Nagra patent. When dealing with top-class loudspeakers, you are entitled to expect the best protection from your amplifier. The PMA will automatically switch to the protection mode in the event of a DC voltage occurring on the output connectors or in the case of overheating. In addition, an overload LED will blink if the PSA reaches its maximum power. The PFC allows the PSA to draw a truly sinusoidal current from the mains. This will avoid electrical pollution and highly spiked currents that can generate undesirable harmonics from the amplifier to the other equipment. This significantly improves the purity and integrity of other devices such as digital and analogue source components. The PFC also minimizes the harmful electrical and nasty audible effects of traditional power supply designs. Last but not least, the PFC reduces the need for filtering; this allows the PMA to use smaller condensers, thus saving space. The PSA offers both balanced and unbalanced inputs on XLR and RCA connectors. The calibrated level for maximum power can be internally selected to 1 or 2V allowing the pyramids to be compatible with any preamplifier or DAC. The PSA features an Auto-detect power-on, it will automatically start upon receiving a signal on the input connectors. It will also turn off after 20 minutes without receiving signal. This is a great feature for a stereo system, and is a tremendous advantage in a multi-channel system.